FUKUSHIMA -- Fukushima Prefecture has won acclaim for its high-quality sake in a nationwide contest, becoming home to the largest number of brands -- 18 -- to win top prizes four years in a row. It was the first time for Fukushima to be the most prolific winner for so many consecutive years. The result of the Annual Japan Sake Awards 2016 (see below) released by the National Research Institute of Brewing (NRIB) last month saw increases in the quality of sake brewed in Fukushima, with the sake becoming more well known both inside and outside the prefecture. It is the sixth time the prefecture has held the distinction of most winning brands. Brewers from across the country competed against each other with sake made in the 2015 brewing year, which started from July 2015. Among 854 entries, 413 brands received prizes, with 227 winning the top Gold Prizes. From Fukushima Prefecture, 26 brands won prizes from among 41 entries, an increase of two entries from the previous year. In the 2015 contest, 24 brands won the Gold Prizes, a record high. In 2014, Fukushima tied with Yamagata Prefecture at 17 winning brands. Members of the Fukushima Prefecture Sake Brewers Cooperative and other local sake manufacturers have been honored with the top prize, despite consumer concern about radioactive contamination from the nuclear plant accident following the 2011 Great East Japan Earthquake. The cooperative actively promotes information about their products to consumers outside the prefecture. Since the 2005 brewing year -- when Fukushima Prefecture had the largest number of Gold Prize winners for the first time -- the prefecture has been ranked first or second in terms of the number of top prize winners. "We are the prefecture that won the most Gold Prizes for four consecutive years. Concerns [about radioactive contamination] still remain among consumers, but we want to take this opportunity to overcome the situation," said Inokichi Shinjo, chairman of the local cooperative. "We're now drawing great attention from people. It is time for each company to continue steady efforts to increase consumers of each product. Middle-ranked manufacturers should work especially hard." "This four-year period is included in the five years since the disaster. Agricultural products of Fukushima are still suffering from a heavy burden -- consumer fear," said Fukushima Gov. Masao Uchibori. "Our prefecture overcame tough circumstances so that we could be No. 1 for four consecutive years. We can attribute this achievement to 'Fukushima Pride.'" The Fukushima Prefecture Sake Brewers Cooperative was also awarded this year's Furusato Sosei (hometown vitalization) Prize of the 26th Minyu Fukushima Citizen Awards, which honors local sake manufacturers. The annual award organized by The Fukushima Minyu recognized their powerful achievement to spread the popularity of local sake all around the nation. The local sake industry, including members of the Fukushima Prefecture Sake Brewers Cooperative and other brewers in Fukushima Prefecture, were filled with joy last month when the results of the Annual Japan Sake Awards were released. They made a pledge to promote Fukushima's sake and their passion on making the traditional drink. "We want more people to enjoy sake," said one member. Kitanohanasyuzoujyou Limited Partnership made a comeback with Daiginjyou Kitanohana, the Kitakata-based brewery's brand that received the first Gold Prize in the competition in a decade. Kitanohanasyuzoujyou survived a tough period when it was almost shut down. "Luckily we won the Gold Prize. Maybe it's beginner's luck," said Shinya Hoshi, 35, sharing the joy with his wife Rie, 32. Hoshi is the manufacturer's executive director and the couple is in charge of producing Daiginjyou Kitanohana. Keishi, the 66-year-old president, said he once considered closing his brewery because of his concern about securing successors as his three children are all women. Amid this situation, his eldest daughter Rie married Shinya in the autumn of 2013 when they were working at a printing company in Tokyo. They eventually decided to become brewers at Kitanohanasyuzoujyou. The couple recalled that they did not know what to do when they took the first step to become toji professional sake brewers, so they went to NRIB and the Fukushima Prefecture Sake Academy to learn the basics. Brewing daiginjo, a quality sake made from rice from which at least 50 percent of the grain has been polished away, was a first for Shinya and Rie. It was also the first time they had used Yamadanishiki, the rice used to make sake. 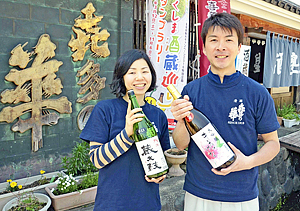 Shinya and Rie's sake, which was made through trial and error, missed out on the Gold Prize in the spring competition organized by the prefecture's cooperative, but obtained a score almost as high as the prize winners. "It probably won't be that easy, but something might happen" -- this expectation turned out to be true and they received phone calls to celebrate their honor at the Annual Japan Sake Awards. "I want to attract people who don't drink sake by treasuring the originality of our brewery," said Shinya. A nationwide sake competition that began in 1911. The contest has been held every year with the aim of improving the manufacturing technology and quality of sake. The brands recognized as the very best among the prize winners may be awarded the Gold Prize. Hiroshima Prefecture has a record five-year consecutive title of the prefecture that has won the most Gold Prizes, according to the Fukushima Prefectural government.